2ft6 Small Single Mattresses. 4ft Small Double Mattresses. 6ft Super King Mattresses. 2ft6 Small Single Divan Beds. 3ft Single Divan Beds. 4ft Small Double Divan Beds. 4ft6 Double Divan Beds. 5ft Kingsize Divan Beds. 6ft Super King Divan Beds. With Memory Foam Mattresses. With Pocket Sprung Mattresses. With Open Coil Mattresses. Triple Sleeper Bunk Beds. Quadruple Sleeper Bunk Beds. 2ft6 Small Single Beds. 4ft Small Double Beds. 6ft Super King Beds. 6ft Super King Size. 5 Years for Total Peace of Mind. From Thousands of Customers. All Mattresess & Divans Made in the UK. Grace Wood Low Foot End Bed in Grey or White with 4 Mattress and 4 Size Options. 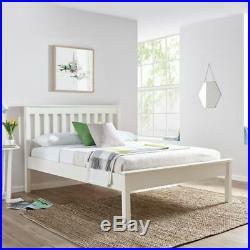 High quality solid pine low foot end bed frame. Available in white and grey finish. Shaker style open slatted headboard. Solid slatted base for firmer support. Manufactured for easy assembly. The beautiful contemporary design and neutral colour of the Grace wooden bed will easily make it the statement piece of your bedroom. The low foot end if the bed enhances the feel of space in the room and makes the bed ease to access from three sides. 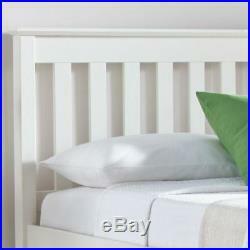 The headboard has elegant open slats in a shaker style. The frame features solid wooden slatted base for firmer support and long mattress life. The gap underneath the bed can be used as a storage area (28cm). Grace Low Foot End Bed. Popular and modern Shaker design. Beautiful White and Grey finishes. Manufactured using Solid Pine Wood. Gapped detailing design on headboard. Luxurious and high quality frame. Solid wooden base for additional comfort and mattress life. Manufactured for easy self assembly. Mattress Type: The following specifies the features for your choice of mattress Spring Mattress. Luxurious Fine Damask Fabric. Hand Tufted, with multi layers of fillings. High count pocket springs individually encased. Luxury fillings with fine damask fabric. 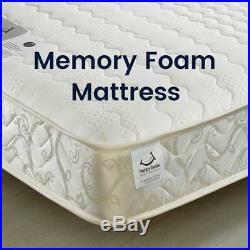 Quality Spring Unit with a layer of Memory Foam. Reacts to body heat. Responds and supports the body. All Mattresses are Fire Retardant and handmade in the UK conforming to the British standards 3ft Bed Frame Measurements. 4ft Bed Frame Measurements. Width: 134.7 cm. 4ft6 Bed Frame Measurements. Width: 150.8 cm. 5ft Bed Frame Measurements. Width: 166.8 cm. Common dimensions for all sizes. 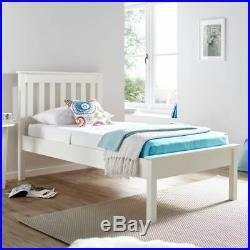 Headboard Height: 109.2 cm. 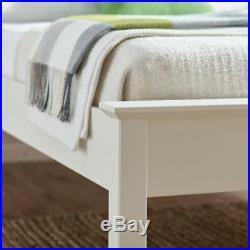 Footboard Height: 47.5 cm. Mattress Depth: 7.5 inches All measurements are approximates. Sleeping on a right-sized mattress not only helps you to correctly fit into your room, but also giving you and your partner adequate space for a comfortable sleep. Thats why we offer a made-to-measure service, to make sure you get it just right. As a rough guide, you and your partner should be able to lie next to each other with your arms behind your head and elbows out, without touching. Your bed should also be 10-15cm longer than both of. Please be aware that while most small single mattresses will fit a bunk bed, often top bunks require a thinner mattress (typically no more than 15cm) to ensure safety for the occupant. 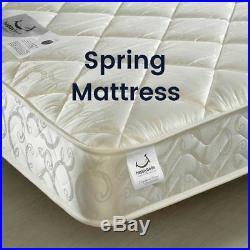 Open spring mattresses are the most common kind. Theyre made of coil springs wired together, so that when you lie on them, they all move at once. 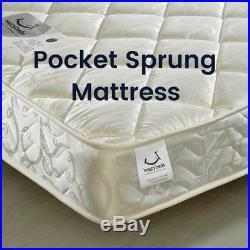 Pocket sprung mattresses are generally better quality. Every spring is housed in a fabric pocket, and all of them are packed closely together. The springs all work independently of each other, which mean they minimise roll-together. The more springs there are, the better supported youll be. Memory Foam & Latex. Famously, memory foam was originally developed by NASA to absorb the tremendous forces astronauts are subjected to during lift-off. It continually reacts and adjusts to your body heat and forms the perfect contour to your body. Latex is less responsive but helps minimise pressure on joints and give relief from the stresses and strains of everyday life. Pillow top mattresses feature an extra layer of soft, pillow-feel material on top of the full standard mattress. These mattresses are top-sided, and not necessary to turn the mattress over, only to turn it end-to-end every so often. Quilted mattresses will give a smoother finish, where the quilting material has been attached to the surface fillings. Tufting is where tapes are passed all the way through the mattress at regular intervals and secured at each end; preventing loose fillings from being dislodged. 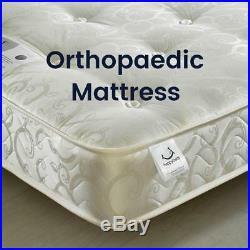 Works well with orthopaedic mattresses, for maximum support. They feature a spring-less base with a wooden frame and an upholstered layer on top. Bedsteads make a stylish choice, and are available in a number of different designs and materials, from classic wooden frames to more contemporary leather or metal upholstered styles. We deliver throughout the U. However, we charge an additional amount to deliver to post codes where its difficult for the courier services to reach you. For a general guideline take a look at the postcodes below. If your postcode begins with any of the following youll be charged an extra small amount. IV, KW, PH17-PH50, PA20-PA78. Isle of Arran & Great Cumbria. Sign Up To Our Newsletter. For the latest news & Offers. The item “Grace Wood Low Foot End Bed in Grey or White with 4 Mattress and 4 Size Options” is in sale since Monday, May 15, 2017. 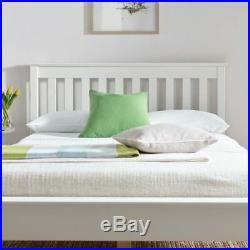 This item is in the category “Home, Furniture & DIY\Furniture\Beds & Mattresses\Beds with Mattresses”. 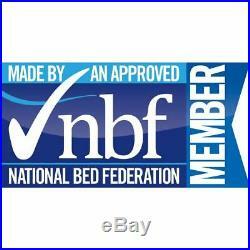 The seller is “happy-beds” and is located in United Kingdom. This item can be shipped to United Kingdom.